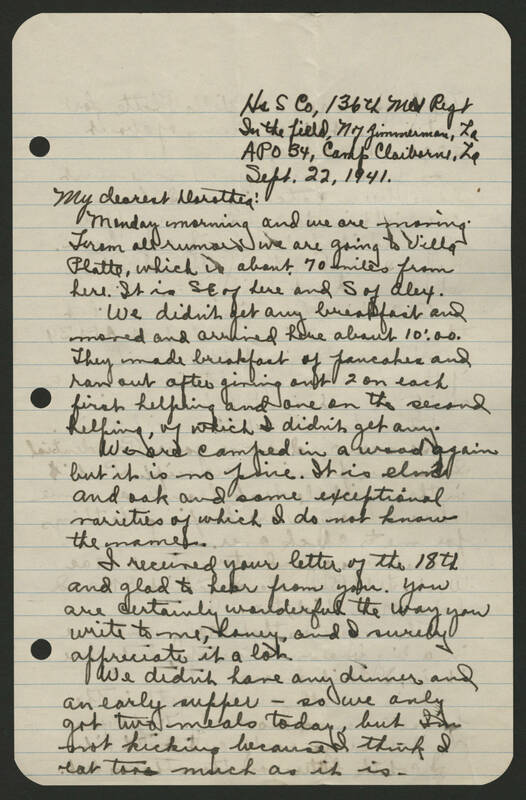 H&S Co, 136th Med Regt In the field, N of Zimmerman, La APO 34, Camp Claiborne, La Sept. 22, 1941 My dear Dorethea: Monday morning and we are moving. From all rumors we are going to Villa Platte which is almost 70 miles from here. It is SE of here and S of Alex. We didnt get any breakfast and moved and arrived here after 10:00. They made breakfast of pancakes and ran out after giving out 2 on each first helping and one on the second helping, of which i didnt get any. We are Camped in a wood again but it is no pine. It is elms and oak and some exceptional varieties of which I do not know the names. I received your letter of the 18th and glad to hear from you. You are certainly wonderful the way you write to me, honey, and I surely appreciate it a lot. We didn't have any dinner and an early supper - so we only got two meals today, but I'm not kicking because I think I eat too much as it is.